Why Most of Us Are Celebrating Jubilee and Olympics – and Not Levellers Day? Is one of the reasons we are in a wave of Jubilee and Olympic celebrations that they have better memes than their rivals? I would call my position as being one of ‘individualistic stance’. But now I’m even more annoyed that I recently missed ‘Levellers Day’. I have been largely passive to the euphoria sweeping the nation surrounding the Jubilee celebrations, and also the hysteria of the Olympic Torch running past our doorways. I would describe myself as a royalist agnostic in that I uphold principles of meritocracy and don’t believe in deference by birth. At the same time however, I somehow espouse a muddled political pluralism and the PR man in me sees how potent monarchy is for the British band, while republican regimes seem to spend just as much on their elected royalty. As for the Olympic torch parade is it only me who sees the underlying mechanics of a PR stunt for corporate sponsors? But my wife was right; being critical without being constructive was rendering me the status of being a ‘miserable old git’. 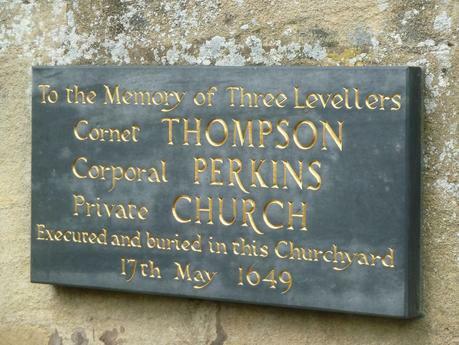 Serendipiditously, I came across a reference to Cornet Thompson and Corporals Church and Perkins who, until recently were buried in unmarked graves in Burford church, Oxfordshire. They were executed on Cromwell’s orders on May 17 1649. The three soldiers belonged to a movement popularly known as the Levellers, with beliefs in civil rights and religious tolerance. During the Civil War, the Levellers fought on Parliament’s side, they had at first seen Cromwell as a liberator, but now saw him as a dictator. They were prepared to fight against him for their ideals and he was determined to crush them. Over 300 of them were captured by Cromwell’s troops and locked up in Burford church. Three were led out into the churchyard to be shot as ringleaders. Now, over 360 years their deaths are honoured by those willing to celebrate and commemorate our political freedoms -which in 1649 were seen as radical heresy – and the wider quest for a fairer, more just society. The only problem is, as I see it, the Levellers need better memes. A meme is a self-replicating form of communication. The song ‘Happy Birthday’ is a meme – you know the words without having to go on a training course. Iconic acts – what can you do, wherever you are in the world to celebrate Levellers Day. St. Patrick’s day for example, has been hijacked by the ‘drink a pint of Guinness’ meme. What can each and every on Levellers Day supporters do? Maybe plant a tree is one idea? Iconic image – what picture can capture the act of celebrating Levellers Day. It needs to be more than a Sealed Knot re-enactment, and perhaps symbolise peace and social justice. A constant date – at the moment celebrations seem to be around the weekend ahead or after May 17th. My advice would be to keep it constant as the weekend before or on the date. Now, I must get back to my preparations to grumble about Olympic Games – but also do my bit to prepare for next year’s ‘Levellers Day’ – on, or about May 17th 2013.